Our Quality Assurance department makes sure that every item which is stitched is of high quality, if even a slight mistake is pointed out in stitching or in fabric, the product is rejected. When the products are fully checked at the quality assurance, they are redirected to the pressing unit, we use steam pressing for all our products to ensure quality pressing of the garments. Appropriate checks and controls are embedded right from purchase of raw material, production and packing of finished goods. 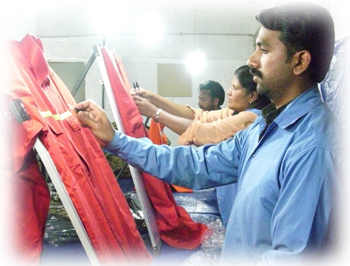 All fabric is checked and sorted as per 4 point system of fabric inspection. Finished goods are inspected and accepted as per appropriate buyer norms. Backed by a skilled workforce, we assure consistent quality and punctual delivery. Not only do we have the ability to develop designs inline with international trends and forecasts, we can also develop exclusively on themes and design ideas suggested by our clients.